Hey, guys, I am posting early as tomorrow I am heading off to Paris with my family! I think most people are saying this, but how quickly is the year going! The fact it is already September is crazy, I mean I am not complaining since it is my favourite time of year. I am pretty happy with my blog posts and how motivated I have been to upload each week so I can't believe its that time again to sit and write my monthly favourites! but I just love the whole concept of the games. The whole thing makes me want to visit either HP Studios or Harry Potter World again!!! To contrast my obsessed with the magical world, I have been loving 90210! Ever since I finished Gossip Girl, I was on the lookout for another series, I think I watched the first episode and gave up but I picked it up again and now I am hooked. So much has happened so far and I am only on season two so I cannot wait to see what continues to happen. At this point, I don't know who to feel sorrier for, Annie or Naomi. Next up, has to be my Passionfruit Yankee Candle, I tend to just burn candles in the colder months but I found this and I thought I would give a go. It is very citrusy and has been giving my room a lovely summery scent. It makes me excited about using candles all the time and I can't wait to get all the Christmassy/Autumn candles out. Skincare favourites have been these two new products, Dermalogica 'Active Moist' and Liz Earle 'Instant Boost Skin Tonic'. After I was given a voucher for my birthday I thought I would nip into to Harvey Nics and pick-up a few more skincare products. I have mentioned my love for Dermalogica before so it was must to see what other products they have. I picked up a set that contained 'Active Moist' as I have been looking for a new moisturiser for a while. It feels so light on my face and gives my face such a refreshing feeling when I apply it. I have also heard amazing things about Liz Earle but never thought to try anything, however, I have been loving this Skin Tonic I bought recently. I apply this with a cotton pad after cleansing and I feel it just make my face feel that little bit cleaner. I know it is just another step in your skincare routine but honestly, it makes such a difference. 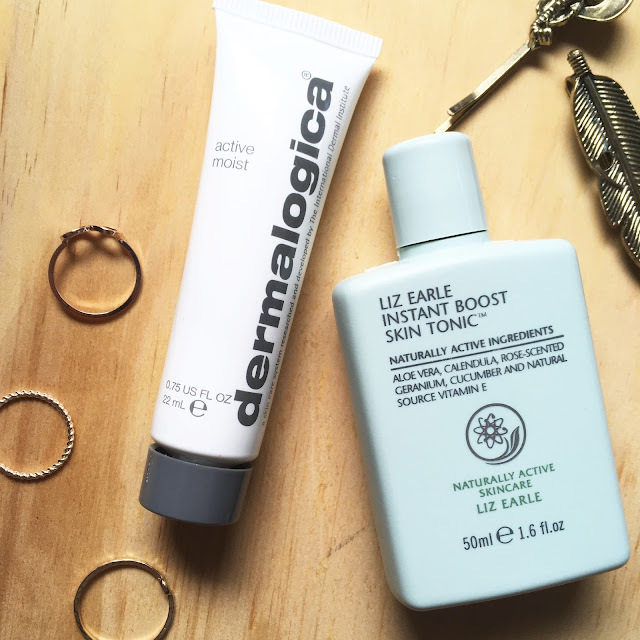 It had given my a 'boost' and has helped tame my break-out. 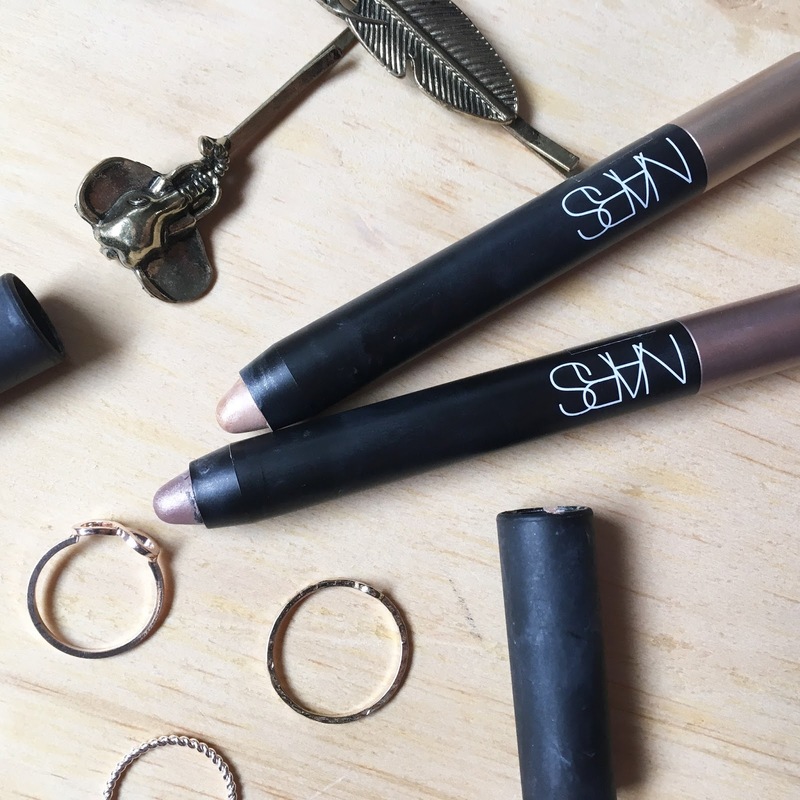 Lastly, has to be my make-up favourites and that is these Nars Eye Shadow pencils, in the shades 'Hollywood Land' and 'Iraklion'. The shades are so pretty, the copper/gold eye will be perfect coming into Autumn. They glide easily onto the eye and with their creamy consistency makes them very blendable. I have been reaching for them when I am in a hurry or want a simple eye look, they are perfect. Let me know what you have been loving this month, What is your favourite summer candle? I really want to do some Autumn posts, let me know if you have any cool Autumn ideas!! How have I done with my first flat-lay? I'm literally watching Order of the Phoenix as I read this! Wish I had time to read the books again. Really good post. I'm so excited to start burning my cinnamon candles again. Try reading them, they are a easy read!! omg yess to cinnamon candles!!! I will definitely be testing out those NARS eye shadow pencils! I love the Liz Earle Skin Tonic! I've been looking at the NARS eyeshadow pencils for a while, you've convinced me to get some!! I really agree with you on the Harry Potter thing! I've been binging on the films lately and I just wish they never stopped if I'm honest. I wanna start the books again but finding the time is hard. Great list of favourites! Harry Potter!! I love everything about Harry Potter haha - literally my childhood...and adulthood tbf! I would love to know more about the Dermalogica products! I've had such a bad breakout recently and this sounds like it could be my sort of product! Those Nars eyeshadow sticks look so beautiful! I recently finished Gossip Girl too and did the exact same with 90210 so maybe I'll try it again! Your really making me want to read all of the Harry Potter books! The Nars eyeshadow pencils look absolutely gorgeous and I love products that you can just put all over the lid. Lovely monthly favourites! Passion fruit Yankee candles really remind me of Christmas and Autumn too. Gossip Girl and 90210 are two of my favourite series as well. When I finished them I was looking for more programmes like them all over again! The Nars eyeshadows look so pretty!